Set right next to a stunning, crescent-shaped sandy beach lined with luscious palm trees and green forest in the Bay of Passikudah, this resort hotel provides modern comforts and amenities for a carefree holiday in Sri Lanka. Nature lovers will enjoy the bay's coral reef, and only a half hour away visitors can find Kallady Lagoon, featuring the famous ?singing fish' between April and September. Additionally, the spectacular ancient ruins and UNESCO World Heritage site of Polonnaruwa is just an hour away. The hotel has 97 brightly decorated rooms, as well as a picturesque outdoor pool surrounded by a deck area with sun loungers and parasols as well as a children's pool for younger guests to splash and play in. Guests can dine on delicious seafood in the onsite restaurant or Mediterranean-style pub. 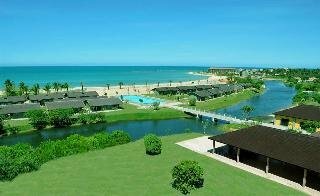 Ideal for a romantic getaway or family retreat, this hotel provides a relaxing beach holiday in Sri Lanka.